So you've decided to buy a soprano ukulele? Soprano ukuleles - otherwise known as 'standard' ukuleles - are the smallest ukuleles out of the ukulele family. Due to their small size and classic tone, they're one of the most sought after ukes. The range of quality can vary at each price point and with each manufacturer. Luckily for us, it's possible these days to pick up a decent ukulele for under $100. If you are an adult beginner, we recommend considering buying a concert size ukulele. You'll still get the classic ukulele tone, but there will be much more neck room - which is very helpful when learning chords. Fret markers on neck and fretboard. Still want the classic ukulele? 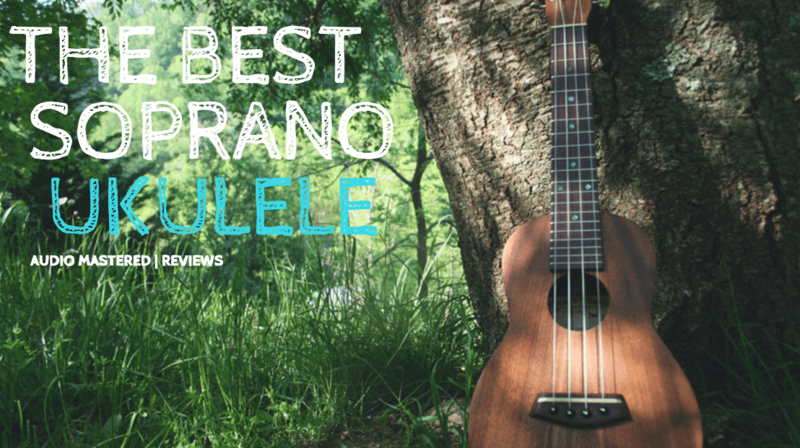 Choosing a soprano ukulele doesn't have to be hard. We've picked the best ukuleles under $100 so you don't have to spend hours crawling the internet. If you're interested, we've also discussed a few considerations you should keep in mind when selecting your ukulele. Let's get started! What is the body made of? Look for rich tonewoods, such as mahogany, as this will largely determine the sound quality of your uke. We suggest avoiding laminate materials when considering the body wood. Although laminate materials will be cheaper, the sound quality will be compromised. Good quality strings will make a world of difference for your sound. If the uke you're considering already comes with quality strings (such as the Aquila Nylgut), this will save you a future investment. The quality of the string will help keep the uke in tune, and have a consistent sound when playing in different environments. Will you be needing a carrying bag? Tuner? Picks? Some of the ukulele packages will contain everything you need to start playing right out of the package. Other ukuleles will only come with the ukulele itself. Keeping an eye on the package accessories and how they affect the price will give you a better idea of what to look for. The small details can be important when selecting your soprano ukulele. Some companies will put a lot of thought and detail into creating a visually appealing ukulele. If this is something that is important for you, you'll want to spend a little more to get that level of detail. Satin finish with open gear tuners and laser rosette sound hole. Our top choice! The Kala KA-15S is one of the most popular soprano ukuleles on the market - and for good reason! The value you get with the KA-15S is exceptional. The full wood mahogany body gives a warm, rich tone - similar to ukes almost double in price! We love the small visual details - such as the satin finish and laser cut rosette - that give the uke a strong visual appeal. Another great feature is the AQUILA NYLGUT strings. These are some of the best uke strings on the market and gives the KA-15S a strong, crisp sound right out of the box. The combination of the mahogany body and Aquila strings gives this ukulele a tone that competes with ukes two times the price. The small additional features, such as the position markers on the side of the neck, make this uke great for beginners and experienced players alike. Don't just take our word for it. There are over 1400 positive reviews on Amazon - one of the most well reviewed ukes. ​Bottom Line: If you are looking for the best ukulele in the sub $100 price range, this it it. The value you get is exceptional. Picking up a ukulele with a full wood mahogany body with Aquila strings for under $60 is unbelievable. You won't be disappointed! 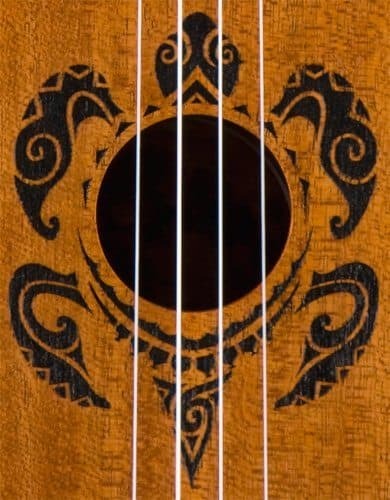 The Honu from Luna is another great quality mahogany soprano uke. Luna is a respectable company in the ukulele market. Known for producing good quality ukes that last. Similar to the KA-15S, it comes pre-strung with Aquila strings. Where the Honu does shine is in the aesthetic appeal. The laser etched design surrounding the hole is based on a Hawaiian turtle, a symbol of longevity and endurance. Each fret marker represents shark teeth, and just like traditional island tattoos, the design is mono-chromatic. The MOP triangle inlay and satin finish both add to the already stunning visual appeal. The tone of this uke is fantastic - which can be expected coming from a full mahogany body and Aquila strings. The only thing we don't like about this uke is the high price point. 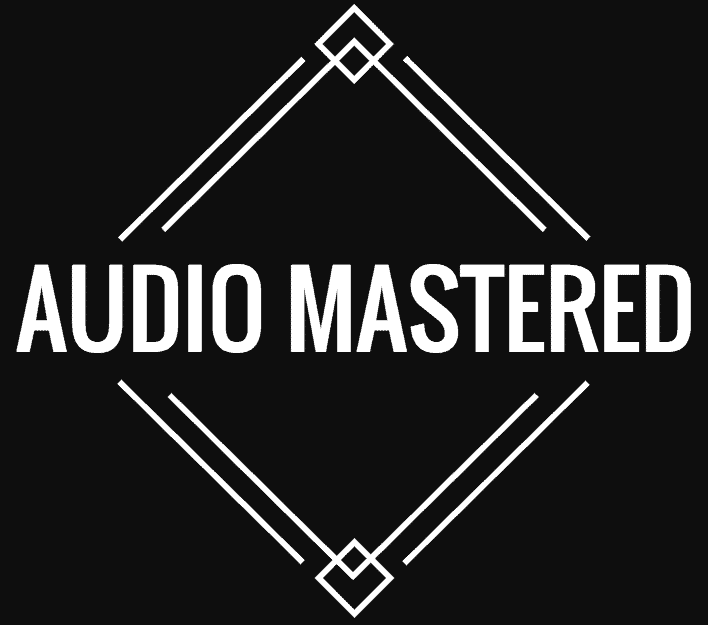 We feel it doesn't provide a huge tonal difference from the KA-15S, but it is double the price. ​It is another well received uke with over 145 positive reviews, and it does come with a gig bag which is a welcomed bonus. If you appreciate the visual appeal, this one is for you. Bottom Line: Another great sounding uke with warm, rich tone. If you'll appreciate the traditional Hawaiian design and aesthetic appeal then this is your uke! The third on our list - the Donner DUS-1. The complete package! Like the others, it has a mahogany body with carbon nylon strings. So you know the sound quality will be there. One of the main features we like about this uke is the included accessories. This package will give you everything you need to get playing for the same price as the KA-15S. It includes a touring bag, a tuner, extra strings, and a strap. 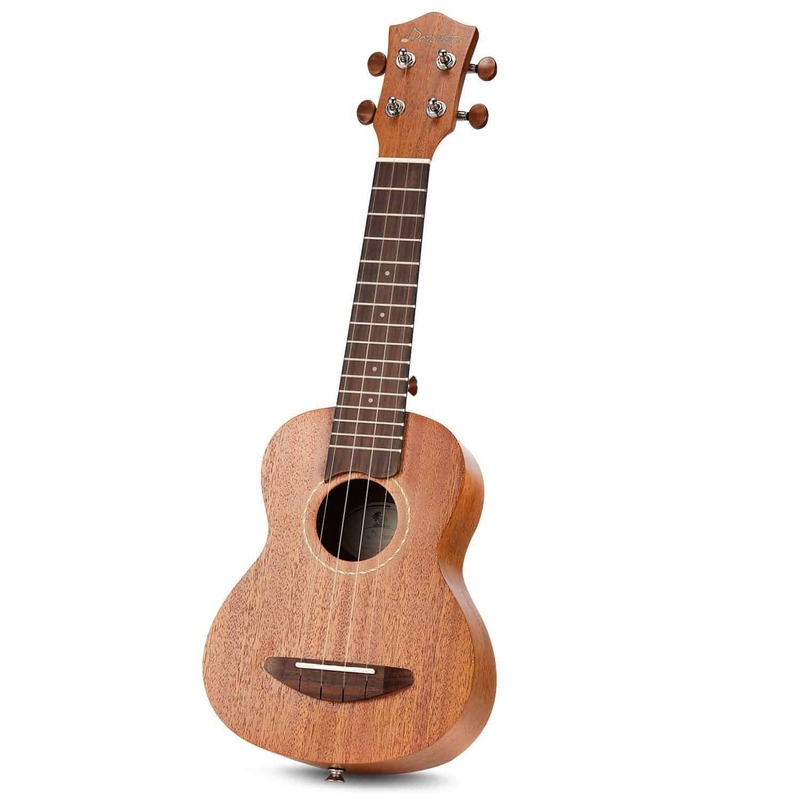 The Donner also ​keeps up with the aesthetic appeal of the other ukes on our list. 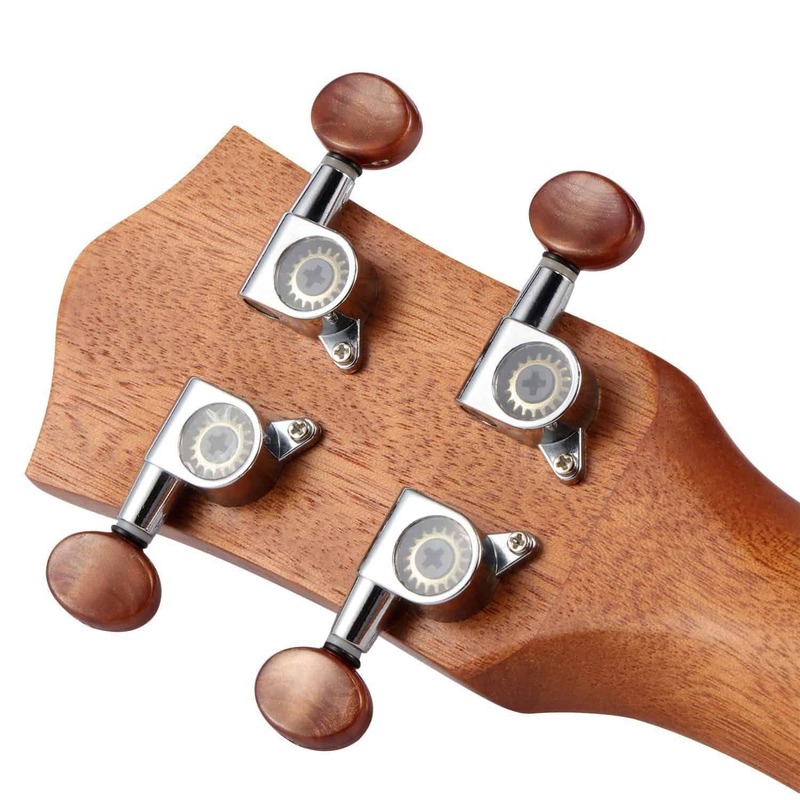 We love the matching rosewood fingerboards, bridge and the chrome-plated guitar tuners. The sound quality will be just as competitive as the others. However, It lost marks for not including the Aquila strings. 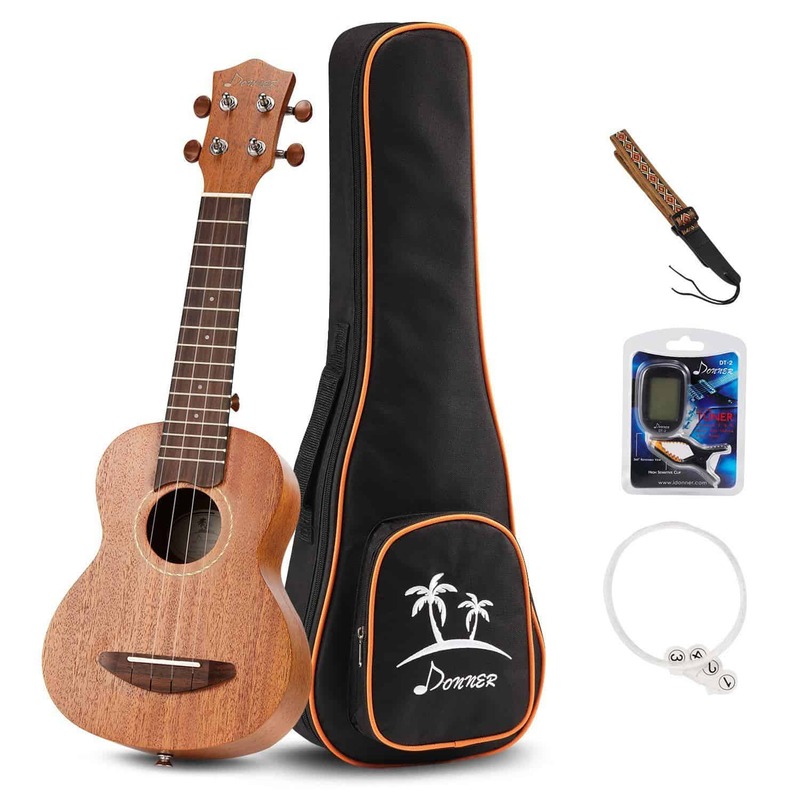 Bottom Line: ​If you are looking for a great beginner package that includes everything you need to get playing, while still buying a high quality uke, this is for you!